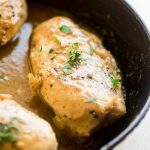 Have dinner on the table in no time with this quick and easy weeknight recipe for maple dijon chicken! Just 5 ingredients, and ready in half an hour. World, meet the easiest chicken recipe ever. Easiest chicken recipe ever, meet world. 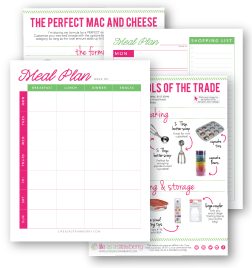 I am allllllll about the easy recipes this week, because Monday was tax day over at Life As A Strawberry HQ – and I think my brain and energy levels are still recovering from filling out ALL.OF.THE.FORMS. and double-checking one million receipts and wallowing in a bit of womp-womp-self-pity over the size of my stupid self-employment tax bill. (Also hi my name is Jessie and I leave important things like taxes until the last possible second). So after all this week’s taxes/paperwork/I-HATE-BEING-AN-ADULT-SOMETIMES, I’m basically only in the market for recipes that 1) Are easy and budget-friendly because WHOA TAX BILL 2) Require little to no brain power and 3) Can be cooked while I have a beer in my hand. Fortunately, this Easy Maple Dijon Chicken HAS. US. COVERED. We’ve been eating this dijon chicken a lot lately. I threw it together on a whim one busy night, and Kyle and I were both kind of floored by how tasty it was (despite requiring almost no prep time). Since then, I’ve made it almost weekly. 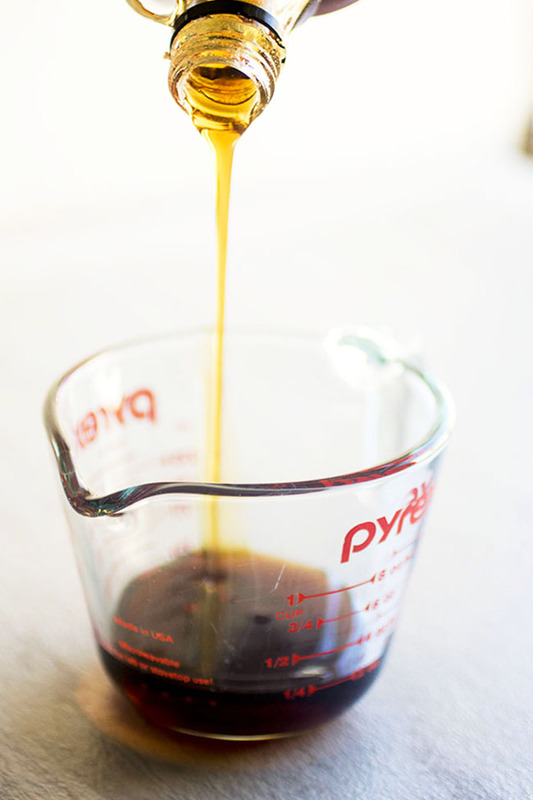 The sauce has just THREE ingredients: Pure Maple Syrup, Dijon Mustard, and Apple Cider Vinegar. (And salt and pepper. But I’m not counting those. Unless we want to be THOSE people and actually COUNT the salt and pepper, and then I guess it’s technically – technicallyyyyy – a five-ingredient sauce. But I won’t tell if you won’t). Also, the whole dish is ready in half an hour. Which leaves plenty of time for you to go finish your taxes if you’re a fellow member of the World’s Greatest Procrastinators Club. I was going to garnish the baked chicken with some fresh parsley, but I opened the fridge to find myself parsley-less (story of my life) so I opted for a bit of fresh cilantro instead. I was a little apprehensive about that pairing – cilantro doesn’t immediately come to mind as the perfect accompaniment to mustard or maple syrup – but Kyle and I both kind of loved it. Yay for happy kitchen accidents! (Although if you’re not a cilantro person, you can totally use parsley or omit the garnish altogether). I ask you to sear the chicken in this recipe before you put the whole thing in the oven, but if you’re short on time you can skip that step and just bake it. 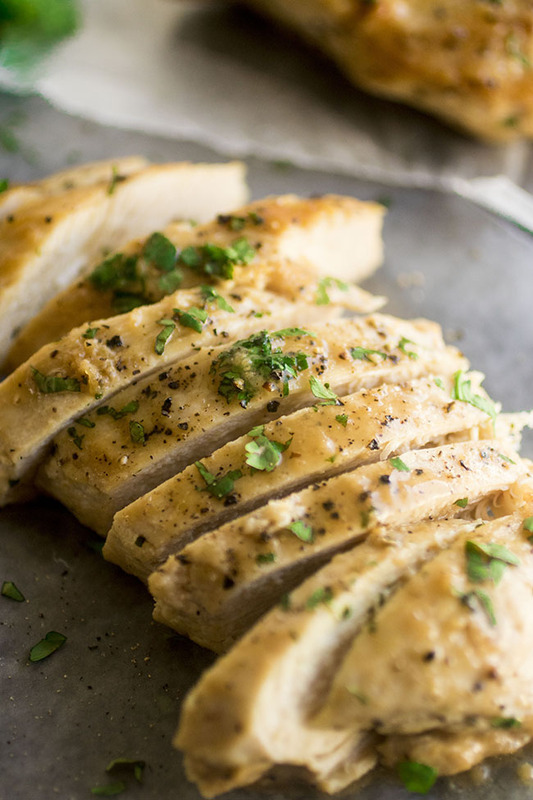 I like the added texture and flavor the searing brings to the boneless, skinless chicken breasts, but I’ve made it both ways and been perfectly happy! No matter how you cook it, though, be sure to let the chicken rest – resting time is CRUCIAL to a tender, juicy chicken recipe because it gives the juices in the meat a chance to redistribute. Serve the chicken with a side of rice pilaf or roasted vegetables, or slice it up and keep it in the fridge for quick salads and sandwiches throughout the week. An easy chicken recipe for busy weeknights. Heat olive oil in a large, oven-proof skillet over medium heat. Season chicken breasts on all sides with salt and pepper to taste. Sear chicken breasts for 3-4 minutes per side until chicken is lightly browned. You don’t need to cook it all the way through here – it will finish cooking in the oven! 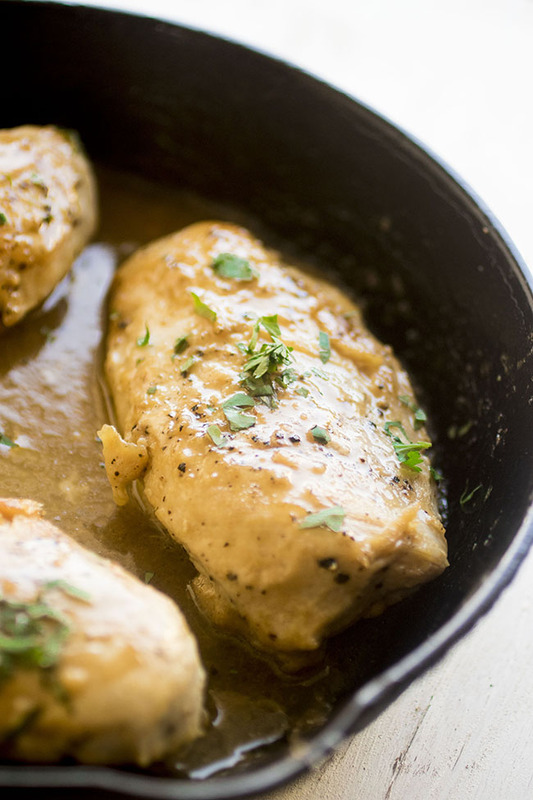 While chicken is searing, whisk together dijon mustard, maple syrup, and apple cider vinegar in a small bowl. Add another pinch of salt and pepper to taste. 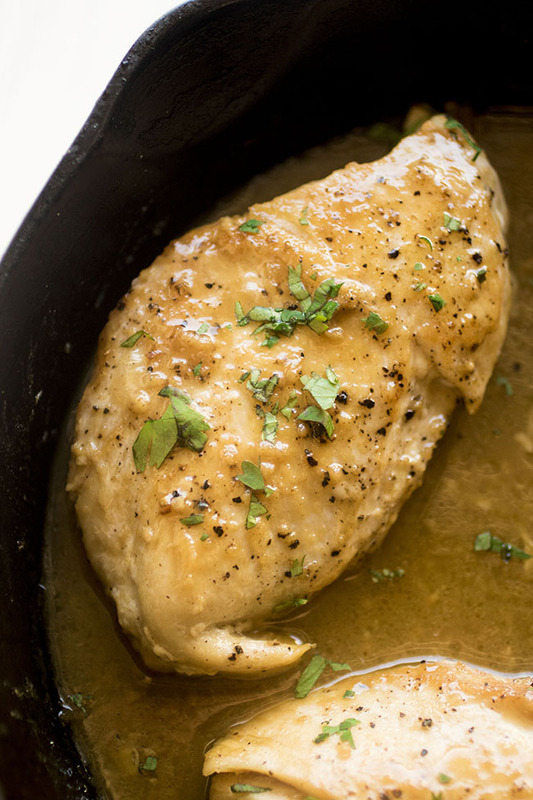 When chicken is browned, remove skillet from heat and pour mustard sauce over the chicken. 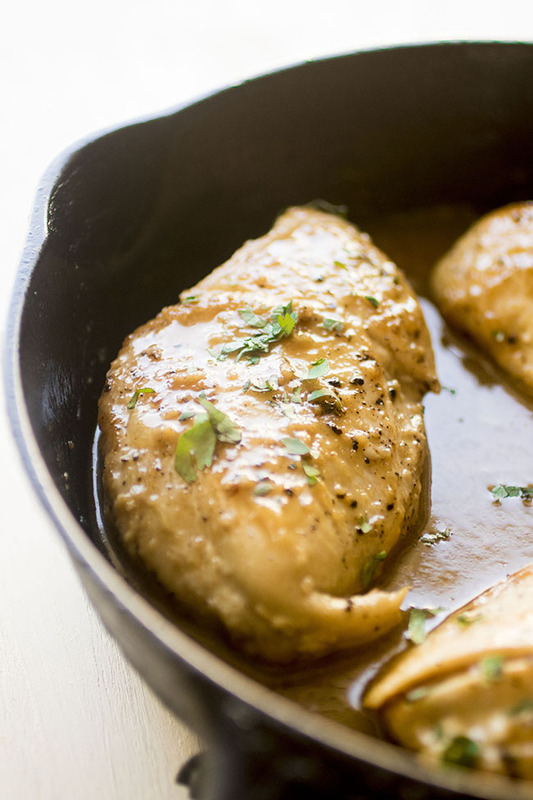 Flip each chicken breast to coat them with sauce, then slide the skillet into your preheated oven. Bake chicken for 7-10 minutes until cooked through. I like to use a meat thermometer to avoid overcooking – the chicken is done when it reaches an internal temperature of 165 degrees F.
Remove cooked chicken from oven and let it rest for 10 minutes so the juices can redistribute. Top chicken with chopped cilantro or parsley and a pinch of fresh ground black pepper. Serve immediately. I like to use a 10″ cast iron skillet for this recipe. If you’re short on time, you can skip the searing step and instead just put chicken in a baking dish, cover with the sauce, and bake at 400 degrees F until cooked through (you may have to add a few additional minutes to the cook time). I like to sear the chicken, though, because it builds a little more texture and flavor into the meat. Enjoy chicken as is or serve over a bed of wilted greens or rice pilaf. We like the flavor of cilantro as the garnish in this recipe, but you could also use parsley! 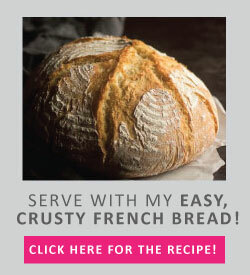 I love your recipes – they are awesome – I haven’t made this dish yet but will do on Thursday – I have a question. I use a copper pan instead of a cast iron – I don’t have a cast iron but a lot of recipes call for it – what do you think? Should I get a cast iron skillet or does the copper skillet achieve the same results. Thank you! Thanks, Shelly! You can use whatever pan you like here as long as it’s oven-safe. I happen to have and love a cast iron skillet, but use whatever you have and like!